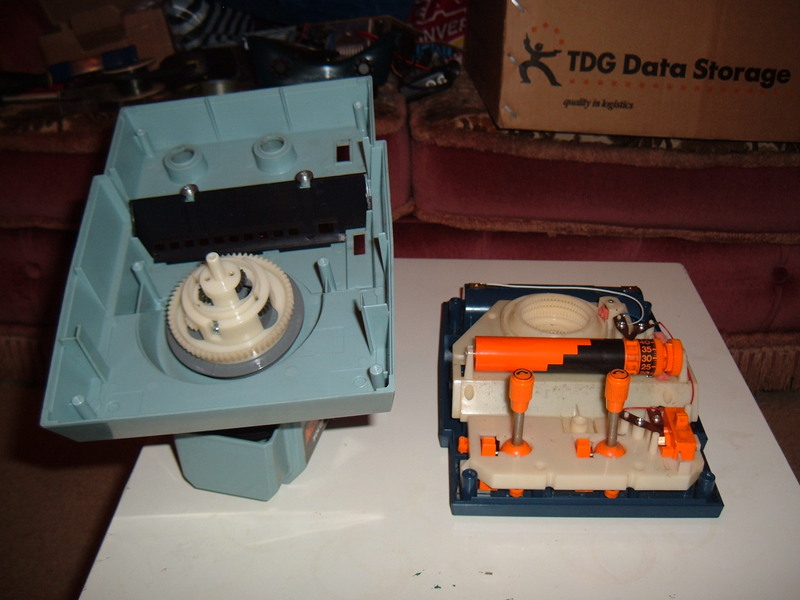 The Armatron I acquired had seen better days certainly, but largely worked fine. The ornamental piping on the top of the arm was missing, and the lower bushing for the “C” joint. The only functional issue turned out that the wrist of the claw wouldn’t rotate clockwise. A puzzle for later on. The first thing to do was to label up the degrees of freedom so I could better make notes as I went, and properly ID each drive train. 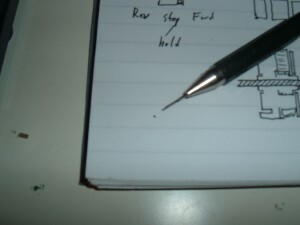 Each joint on the arm is basicly a set crown gears in the centre of the axis, allowing the drive train to turn corners. Not especially interesting, but worth noting. This end of the drive train wouldn’t be taken apart, as it’s visible already. The shoulder of the arm is a different story though, and will come later. Out came two old D-cells, 6 screws that held the base on (yellow arrows), and one wide-flanged screw that held the base of the arm centred (red, obscured by batter hatch). The two halves simply pull apart. Next, matching each gear to it’s axis. Each gear was set at it’s own height, which made sense. In the second image you can see the contacts for the timer. 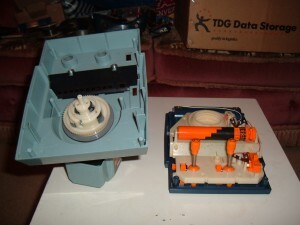 The Armatron was made so you had to perform challenges against the clock. It’s just a cylinder on a worm-gear off the motor though. When it’s turned so all-black shows, the contacts break the circuit and the motor stops. Easy to remove if you want your Armatron to run indefinitely. 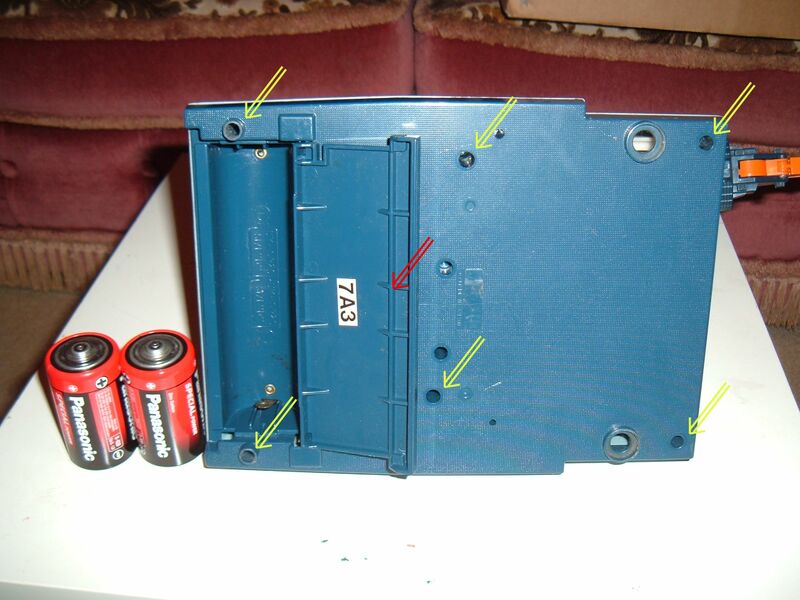 You’ll also need to undo the contacts for the start switch, or you won’t be able to lift the cover out of the way. And finally, the gearbox itself! From above you can see two lines of sprockets. 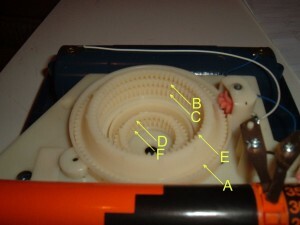 The lower one connects to the various gear arrangements that take the power to the base of the arm. The upper sprockets connect to the lower ones. 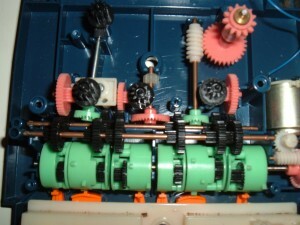 For those of you that have noticed the studs on the green drums, you may already know how this gearbox works. Each joystick has three degrees of freedom. Left-right, up-down, and being turned clockwise-anti. At this stage the joysticks lift out of their carriers. Each has a stud underneath and one out from the side. 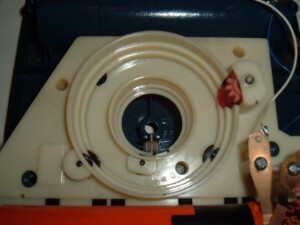 Undoing another two screws lets the cover for the joystick mechanism lift off. These guides turn the motion of the joysticks into simple back and forth motions of the pins that touch the studs on the green drums. These green drums are gear carriers. Running down the centre of these carriers is the main drive shaft, and within each carrier is a drive gear on that shaft, and an orbiting gear attached to the carrier itself. The joystick pins at rest sit against the wider centre stud of each carrier’s outer surface. 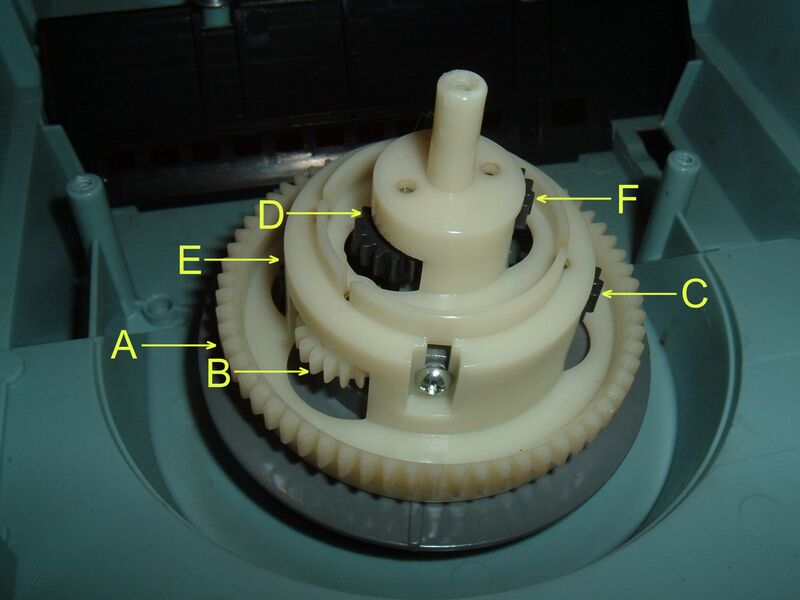 There are two type of carrier in this gearbox. 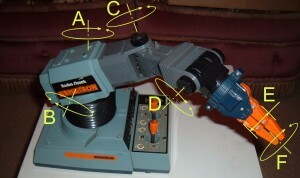 Two shorter ones that run from the turning motion of the joysticks to the claw (E) and wrist (F). The four longer carriers have 5 studs on their circumference, while the short ones have three. 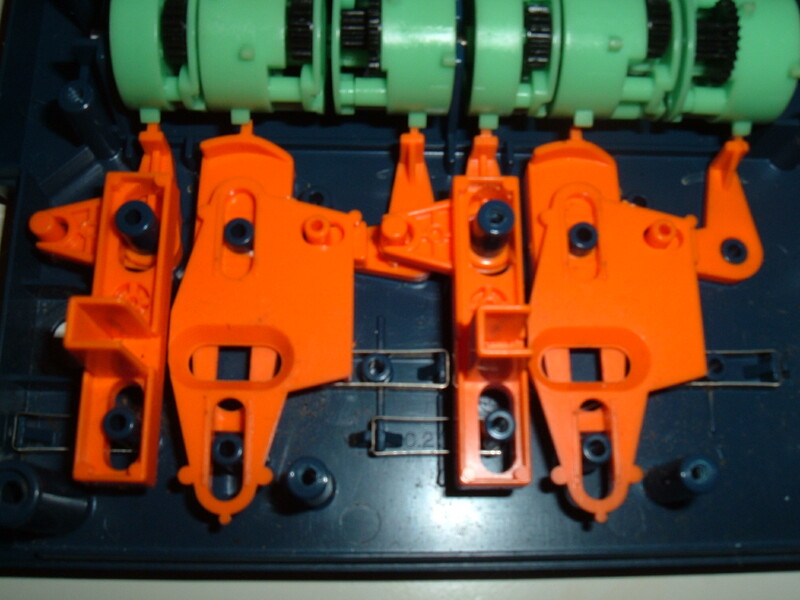 the longer carriers also have two gears, while the shorter ones just have one. With some coaxing of the motor, the way this works became obvious quickly. 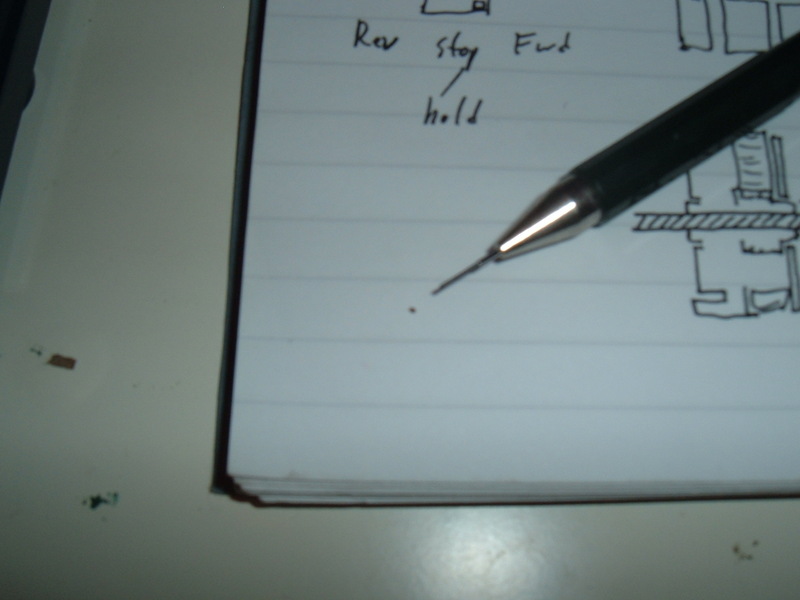 The “rest position” stud holds the carrier-gear away from any other gear, spinning uselessly. However when the joystick moves, the drive shaft turns the carrier until one of the other studs makes contact with the pin. 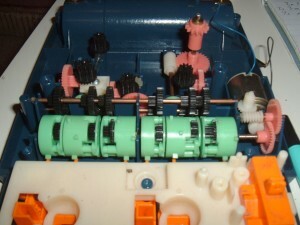 These pins are positioned so that the carrier rotates around for the carrier-gear to mesh with one of the output gears. 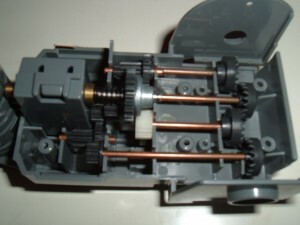 Moving the pin to the right stops the carrier at the right stud and the carrier-gear engaged with the bottom output gear. Moved to the left the carrier turns further and stops with the carrier-gear engaged with the upper output gear. That upper gear outputs into the lower gear, so with the extra gear in the train, the output is reversed! It’s all so simple in retrospect. But it didn’t explain the extra studs on the longer gears. The extra gear on the longer carriers did though. The longer carriers operate like the shorter ones, except that when the outermost studs are used the second two-tier gear makes contact instead. This has a higher gearing ratio, so the output is much faster. So pushing the joystick a little way runs the movement slowly, whereas pushing it further runs it at higher speed. This wasn’t something I’d previously noticed, so came as a very pleasant surprise! While investigating this, I noticed the wrist control stuck at the gearbox level, and by turning it manually I eventually spotted a tiny speck of grit, and the marks it’d left in the carrier-gear. With it removed, the gearbox now works fully again. Bonus! Always amazing that such a small thing can cause such big problems. With the exploration at a satisfactory end, I reassembled the mechanism. It all still worked, so I decided to press just a little further. While the axis of the arm are straightforward, the “shoulder” seemed it might be more complex due to the number of drive trains that had to pass through it. So apart it came. For future reference, if you ever decide to open up the shoulder, you should do it while the arm is detached from the base unit, and while held upside down. Or all the gears fall out. The latter shows the gears as they should appear. Overall a very entertaining and insightful look into how you can control a complex process using purely mechanical systems. Certainly inspiring in a children’s toy that’s older than I am, though with the sheer parts count I can understand why the following versions shifted to individual motors for each axis. But never forget what can be done with just gears. With my curiousity now satisfied, I think the Armatron will go back onto ebay this week, with the hope it’ll find a nice new home. This entry was posted on Monday, September 15th, 2008 at 11:58 pm	and is filed under Dissection. You can follow any responses to this entry through the RSS 2.0 feed. You can leave a response, or trackback from your own site. Fantastic piece of investigation. I always wanted an Armatron when I was a kid & eventually tried to build my own out of technical lego. I only managed about two of the joints though because the mechanical challenges were just too complex. I can’t imagine a child today getting so inspired from an iPod! My best advice is to remove the arm from the base to start with, and see if the transfer gear for the claw control is moving at that point. If it is, then the problem must be in the arm. If it’s not, it’s likely in the control gearbox. If it doesn’t open or close at all, then it seems likely something large and noticeable will have happened, like a drive shaft coming out of it’s mounts. But these are small gears, so be aware it could be tiny mote of dirt causing it. Have a toothbrush and some cocktail sticks on hand, they’ll be good for tidying up inside. I think I have found the problem. The transfer gear to the claw spins a little then it stops when there is a load on it in either direction. I followed the shaft and guess what, there is a little 10 tooth gear that is cracked. I think that gear is spinning on the shaft when a load is applied. 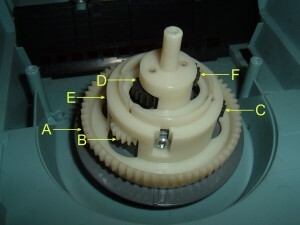 Where can I find a new gear and how do I identify this gear so I can find a replacement? I can’t say it would be an exact match, but if memory serves they’re about the same size. Try looking for spares for Scalectrix or “slot cars” or other small track-racing cars. They use similar size crown gears to power the rear axle from a central motor. Ebay and specialist scalectrix model sites will have them. You can probably get away with just about any gear ratio that will fit. It’ll only make it turn faster or slower. 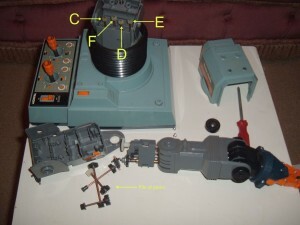 hi, I have armatron since since 1987, I have lost some/many of the gears, I want the part list so that I can re-assemble it. Do any one has its part list?? I have no spare parts, or a parts list. 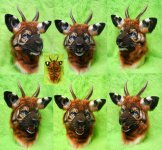 However many parts were re-used, so you may be able to replace parts by getting a home resin-casting kit and duplicating the parts you do have. 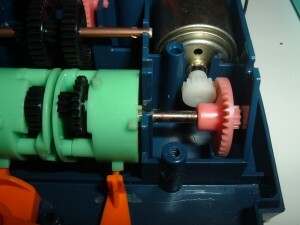 Alternately, other small gears may fit if they’re not part of the control gearbox. Hello. Great tutorial may I say. 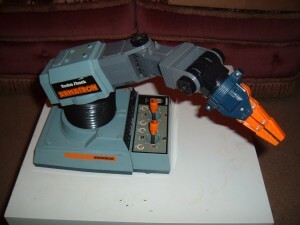 I bought my Armatron in the mid 80’s when I was a budding young engineering geek. I was getting deep into cnc machine tool design and just could not believe someone made a toy manipulator arm that was entirely mechanical ! At the time I worked at a large die cast foundry and I realized this toy had more freedoms of movement than the unloading robots we used on the casting floor! 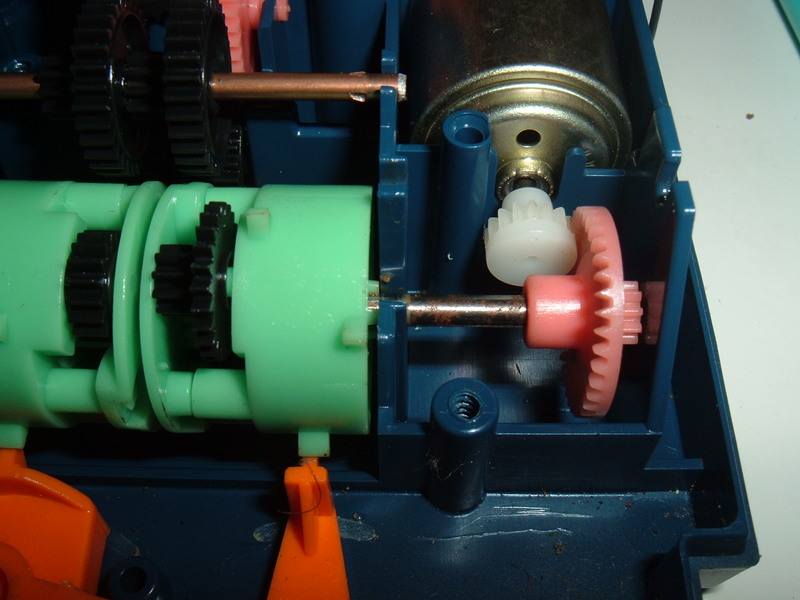 I kept the toy on my desk at work until it developed a “tick” somewhere in the gear train that opens and closes the gripper. I had to haul the Armatron out of the closet the other day when my kids and I came across the CrabFu video of his steam conversion. Of course it still has the tick but maybe I’ll take it apart and see if it can be corrected. To order parts call 1-800-843-7422 or visit your local RadioShack store. Joe, see the link/list “numanair” posted, it has the full Radio Shack spares list. I contacted RS to get a replacement motor. They replied it’s an obsolete part so they have no information. Does anyone have specs on the motor (Speed, etc) or a mfg part number on the Armitrons they are working on? Even a guess while observing an operating unit will be helpful. Excellent piece of work! I’m getting ready to take my armitron apart and harvest some components for a project. I have to say this guide will help a lot, however, I’m seriously reconsidering canabalyzing this beautiful piece of machinery. Awesome Job! My mother found my Armatron stashed in some box full of stuff from god knows when. I couldn’t believe she had kept it all these years! So I put some batteries in it and, much to my displeasure, nothing… I opened it up thinking I’d find a bunch of rusty gunky old pc parts. 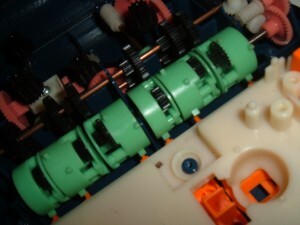 Of course, whats actually inside the Armatron is like a finely built Swiss watch. Turns out it was just the contact plate on the batteries that were a bit too corroded. Some WD40 and BOOOM, the armatron roared back to life!! I felt like a little kid again! I’m having a bit of trouble putting the clamp back onto the Armatron…. specifically with the gears tht go between the gear tht stick out from the “wrist” and the clamp… Help?? Otherwise… I’ve been able to disassemble and reassemble everything else… Ur guide is awesome! I cant believe you took it apart so casually and then detailed how it worked and then put it back together. I bought one for my son and then I took it apart because I had to see how it worked. You didn’t mention that both joysticks also have a twist function. If I remember right that is ten different controls and in each direction the joy sticks can run at two different speeds. Also worth mentioning is the fact that it can do any or all functions all at the same time. I came here looking for the next generation Aarmatron but so far I haven’t found anything? I’ll echo another comment above… since Radio Shack no longer has information, can someone give the specs for the motor? I’d love for my son to play with this! Hi. 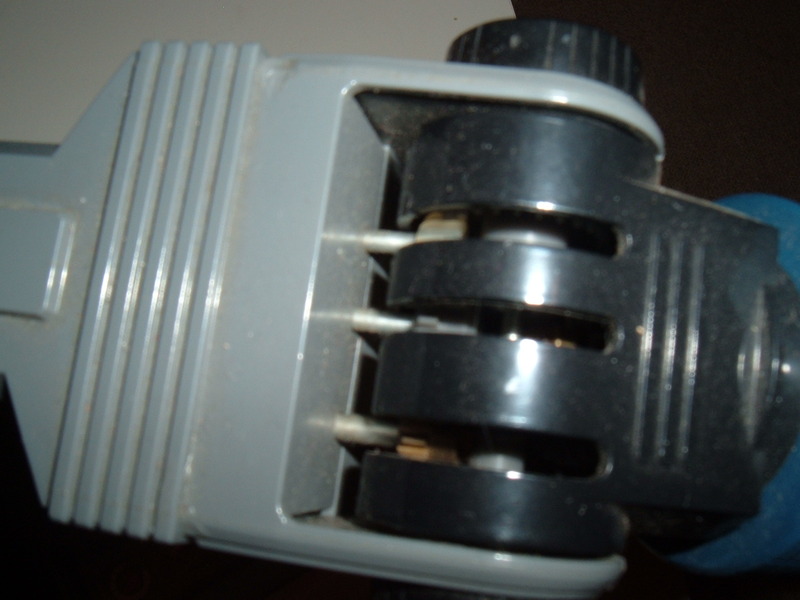 I need to replace the 3volt motor in my Armatron/Robo1… I cant seem to find the correct RPM value. Finding a replacement motor is very easy but finding the right RPM is a nightmare… any thoughts on this would be greatly appreciated thanks. Is it worthwhile lubricating the gears when reworking this. If so, what is the best lubricant? Afraid I sold the arm on years ago now, so I can’t check for you, sorry. Small DC motors are cheap though, so buy one low and one high, see which works better. You could also rig an arduino to control the motor you have and see at what PWM percentage it works best at, then divide the motors full speed RPM at that voltage by the PWM to work out your target. Probably not if it’s going to be used as a toy again. It’ll just clog the gears when dust or dirt gets in. The directional gearbox also needs a lot of free motion and the surface tension of a lubricant would probably make those gears stick. The simpler gears in the joints of the arm itself though, if it’s going to be used in a clean environment, might run a bit better with some white lithium grease on them.